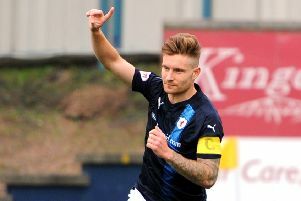 Raith Rovers stayed top of League One on Saturday after a hard-fought 1-1 draw with title rivals Ayr United. Greig Spence cancelled out Lawrence Shankland’s first half opener for the visitors early in the second half and the teams then went toe-to-toe looking for a winner. None came, and although Rovers lost their 100% home record this season, they will not be too disappointed with the draw which kept them a point clear of Ayr with two games in hand. Here is a gallery of pictures from the game by match photographer Walter Neilson.